READ: Rep. Salmon Says Republicans Who Voted To Keep Govt Open "Surrendered To The Demands Of Planned Parenthood's Management"
Arizona Rep. Matt Salmon (R-CD5) released a blistering statement after 91 House Republicans and 32 GOP Senators voted with Democrats to keep the U.S. government operating until December 12 without cutting off monies to Planned Parenthood. Salmon said the GOP "yes" votes "surrendered to the demands of Planned Parenthood's management" instead of "taking a principled stand against arguably illegal activities". Arizona's two GOP Senators - John McCain and Jeff Flake - and Rep. Martha McSally (R-CD2) voted "aye." “Today’s vote lacks the leadership our nation is demanding. Rather than taking a principled stand against arguably illegal activities, the House today surrendered to the demands of Planned Parenthood’s management and took up a continuing resolution that aimed to continue providing funding to an organization under multiple investigations for their potentially illegal abortion practices. With seven hours left in the month, four out of Arizona's five GOP Representatives voted "nay" on an authorization measure to keep the federal government operating past midnight. Rep. Martha McSally (R-CD2) teamed with 90 other Republicans and all 186 (voting) Democrats (277-151) to send the measure to the President's desk. He already signed. it. The government is now funded until December 12. Earlier in the day, Arizona Senators John McCain and Jeff Flake (both Republicans) joined with 76 other Senators to send the measure to the House. "You're profiting off death... and that's appalling to me." With that, Arizona Rep. Paul Gosar (R-CD4) rested after his cross-examination of Cecile Richards, the President of the Planned Parenthood Federation of Arizona. Gosar used his five minutes of the House Oversight Committee time to attempt to show that Planned Parenthood's national organization has increased its profit* by providing less Medicaid-reimbursed healthcare in favor of "profit centers" like abortion. As he saw his time was expiring, Gosar skipped ahead to his final point and had to tell Richards that he was changing the process where they had been interrupting each other: "This is my time, this is my time, don't interrupt." Gosar also attempted to point out that Planned Parenthood has reduced the cost of (some sort of) contraceptives to $3/unit but gets Medicaid reimbursement at the rate of $35/unit. ** Richards disagreed with several parts of that analysis, and Arizona's Politics has not yet researched the issue. Republicans are attempting to "defund" Planned Parenthood. Most of the money that the organization receives from the U.S. come through states as Medicaid reimbursements for (non-abortion) medical services. A small portion comes from Title X grants, for which Planned Parenthood provides family planning (non-abortion) services. *Gosar and Richards sparred briefly about the term "profit". Planned Parenthood is a non-profit organization, and the two agreed that the amount of "revenue over expenses" has increased over the last several years. **Gosar pointed out that - as a dentist - he is familiar with Medicaid reimbursements, and that they are not good. Arizona Rep. Martha McSally (R-CD2) and the outgoing House leadership are reviving the non-controversial "Border Jobs For Veterans Act" that they helped abort 1 1/2 weeks ago as part of the effort to avert a Planned Parenthood-related government shutdown. McSally is the primary sponsor of the House version of the Border Jobs For Veterans Act. Three Arizona colleagues - Reps. Ruben Gallego (D-CD7), Paul Gosar (R-CD4) and Kyrsten Sinema (D-CD9) - are among the 17 bi-partisan co-sponsors of the measure that passed on a voice vote in the Senate earlier this month. The measure - sponsored by Arizona Senator Jeff Flake (R-AZ) was sent to the House, where - as Arizona's Politics reported - it was gutted and replaced with the "Born Alive Abortion Survivors Protection Act", sponsored by Arizona Rep. Trent Franks (R-CD8). The House leadership pushed it to the Floor without any committee action, as part of a two-measure package giving House members a chance to vote for punishing Planned Parenthood and threatening employees at abortion clinics with five years prison time. The measures passed the House on largely party line votes. While Arizona's Politics pushed Congressional offices last week for answers on how the House GOP came to vote against border security and jobs for veterans in favor of a symbolic pro-life vote, McSally's "related measure" was quickly (i.e. without committee action, aka not in regular order) put on the calendar. McSally's Communications Director Patrick Ptak tells Arizona's Politics (by email) that McSally's office had been in contact with both House leadership and her Senate counterparts (e.g. Flake's office) regarding the bill. He adds that "we’re happy to see it come to the floor today." Assuming it is passed by the House today, it will have to again be voted on by the Senate before reaching the President's desk. Arizona's Politics published the text of the Senate bill (identical to McSally's House companion) here. Francis' speech to a joint session of Congress (Thursday). Later that day, NextGen Climate Action signed contracts to air an ad in Phoenix countering Gosar and touting the Pope's comments on climate change. Yesterday, Democratic Reps. Raul Grijalva (D-CD3) and Ruben Gallego (D-CD7) teamed up with NextGen to semi-gently chide Gosar to listen to the Pope. The ad buy does not mention Gosar (or anyone else), and is titled "Dear World". The script is a collection of quotes from the papal encyclical about climate change. NextGen press secretary Suzanne Henkels tells Arizona's Politics* that they want to "ensur(e) that (Gosar's) constituents will hear the Pope’s powerful message on climate change", and NextGen increased the broadcast and digital buy to more than $400,000. The ad was not originally planned to air on Phoenix TV stations - only on national cable, in Washington, D.C. and in five states. NextGen issued a press release yesterday with comments from billionaire founder Tom Steyer, and Democratic Reps. Grijalva and Gallego. Only Steyer named Gosar. Grijalva stated that "Unfortunately, Congressional Republicans continue to turn a blind eye to the need for increased sustainable energy, reduced carbon emissions and the development of new green technologies." And, Gallego added "I hope his message resonates with politicians on both sides of the aisle." *Full comment from Henkels to Arizona's Politics: "On Friday, Arizona Congressman Paul Gosar announced that he plans to boycott Pope Francis’ upcoming address to the U.S. Congress. While Congressman Gosar may not want to hear Pope Francis’ call to action on climate change, Americans are looking to the Pope for leadership on this critical issue. NextGen Climate is ensuring his constituents will hear the Pope’s powerful message on climate change by running our new ad, “Dear World” in Gosar’s congressional district. We’re calling on Gosar’s constituents to reach out to their Congressman and encourage him to listen to the pope’s urgent call to action on climate change." Arizona Rep. Martha McSally (R-CD2) joined with 10 other freshman Republicans in signing a letter urging hardline conservatives to avoid a government shutdown over the Planned Parenthood issue. The letter, from the freshmen in the 65-member Republican Main Street Partnership, puts McSally at odds with Arizona's four other Republican Representatives. Salmom, Gosar, Schweikert and Franks are all members of the House Freedom Caucus, consisting of the more conservative members at odds with House leadership. Salmon has been among the leaders of the latter. Arizona Republic reports on Court of Appeals decision affirming decision to deny effort to hold Glendale referendum on settlement agreement with Tohono O'odham regarding the West Valley casino. Republicans in the House of Representatives today erased the non-controversial Border Jobs For Veterans Act, and replaced it with a much-more-controversial "Born-Alive Abortion Survivors Protection Act". Arizona's Politics previously reported that the new bill had been tacked on to the unanimously-passed Border Jobs For Veterans Act. In fact, the House's move was a "strike everything" amendment that used Arizona Senator Jeff Flake's measure as a vessel, and it will now be sent back to the Senate with the measure that could impose five-year prison sentences on anyone working in a clinic who does not contact law enforcement if an aborted fetus moves and is not admitted to a hospital. Here is the text of the resolution that paved the way for today's votes. (also, below) Section 4 provides for the removal of the veterans/border jobs language from Flake's bill. Flake had just (last week) touted the unanimous passage of the bill, and spoke of its importance. Arizona's Politics has asked Senator Flake's and Representative Franks' offices for comment on this startling development. Arizona Rep. Trent Franks (R-CD8) introduced his "Born-Alive Abortion Survivors Protection Act" earlier this week, and the House today approved it and replaced Arizona Senator Jeff Flake's Border Jobs For Veterans Act with it today. for any clinic employee who does not report an abortion which results in an aborted fetus making any movement after being removed from the pregnant woman. The measure - introduced on Tuesday by Franks, and with all Arizona Republican colleagues except Martha McSally (R-CD2) signing on as co-sponsors - was rushed to the Floor as part of the wrangling and threats to cause a government shutdown over the Planned Parenthood defunding issue. It passed on a party-line vote of 248-177 (with 5 Democrats voting "aye"). It will now go back to the Senate as the full content of what had been the non-controversial Border Jobs For Veterans Act proposed by Arizona Sen. Jeff Flake. That had passed the Senate on September 9. As noted earlier, many House conservatives - with Arizona Rep. Matt Salmon (R-CD5) in the forefront - are leery of the House GOP leadership's plans to give anti-Planned Parenthood, anti-abortion Representatives a chance for "feel-good" votes which will not result in the measures becoming law. 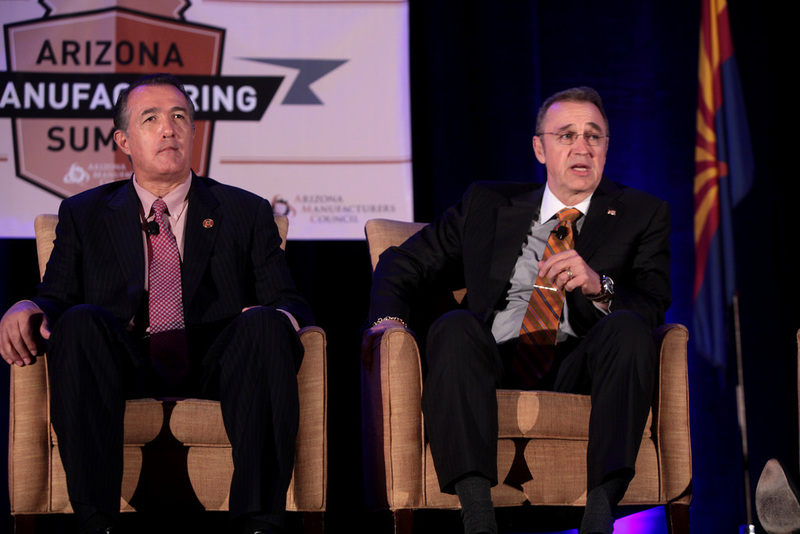 Arizona Rep. Matt Salmon (R-CD5) is in the forefront of conservative House Republicans accusing their leadership of playing games with the Planned Parenthood defunding effort. He is quoted on Politico.com this afternoon as saying Speaker Boehner's (and, leadership's) plan to avert a government shutdown over the issue "fails to move the needle" and is "pure political posturing". Conservatives in the House believe that the Republican leadership is permitting these votes as part of a deal to stop a threatened government shutdown over the Planned Parenthood defunding effort, and promising to continue it in the budget reconciliation process later in the year. Arizona Rep. Paul Gosar (R-CD4) announced this morning (on conservative Townhall.com) that he was boycotting Pope Francis' speech to a Joint Session of Congress because his Pope is acting like a "leftist politician" focusing on "the fool's errand of climate change." Earlier this year, Gosar scolded President Obama for his "temper tantrum" and "breach of protocol" (and, presumably, the other Democrats who followed suit) for his treatment of Israeli Prime Minister Benjamin Netanyahu when he addressed a joint session of Congress. Gosar - a self-described "proud Catholic" - said today that he is skipping the Pope's address because "media reports indicate His Holiness instead intends to focus the brunt of his speech on climate change - a climate that has been changing since first created in Genesis. More troubling is the act that this climate change talk has adopted all of the socialist talking points, wrapped false science and ideology into 'climate justice' and is being presented to guilt people into leftist policies." He states that he "would be there cheering him on" if the Pope spoke out "against violent Islam", although the Pope may also do that in his address. The Pope was invited to address Congress by Republican Congressional leaders. The same leaders who invited Netanyahu to speak weeks before an Israeli election. At that time, President Obama and a couple of dozen Democratic lawmaker declined to attend. Gosar spoke out forcefully against those who declined to attend Netanyahu's address: "I Stand With Israel. You? I am pleased israeli Prime Minister Benjamin Netanyahu will speaking to us tomorrow in Congress. The truth about what is going on with our inept administration and Iran needs to be discussed. I am disappointed the President has acted so inappropriately towards our guest--a guest we invited to speak at the People's House. The only breach of protocol is the President's temper tantrum." Arizona Rep. David Schweikert was the final speaker this evening before the debate on the Iran nuclear agreement was closed by the ranking members, and he further brought it home by pointing out Iran's actions in "our hemisphere". Schweikert noted that finance ministers at a conference in Panama recently told him about Iranian money coming through their banks. Schweikert held up a chart of Iranian actions around the world, including in Mexico. * Not mentioned was whether opponents of the agreement would accept responsibility if the agreement is blown up and bad happens. Arizona Senator Jeff Flake (R-AZ) focused his Senate floor speech this morning on the claim that the Obama Administration chose to make the Iran nuclear deal an agreement instead of a treaty that would have required Senate approval. In March, Flake was one of the only Republicans to not sign a letter warning Iranian leaders that the (then-potential) deal would not have future force and effect. Flake also took advantage of the increased audience for the debate to plug his Border Jobs For Veterans Act, which passed the Senate on a voice vote yesterday. Here is the text of that, which now goes to the House. BIPARTISAN OOPS! C-Span Closed Captioning Confuses Two of Arizona's Three Women Reps.
Arizona's Politics just published an article/video of Arizona Rep. Martha McSally (R-CD2) speaking on the House floor this morning. When we went back to must-see C-Span TV, imagine our surprise when the transcript showed that fellow Arizona Rep. Ann Kirkpatrick (D-CD1) had also spoken. Needless to say, we pulled the note. This is the explanation for those of you who may have wondered, "WTF?" WATCH: Rep. McSally Sets Stage For Iran Nuclear Deal Debate With 9/11 Remembrance; "Sparked a Renewed Sense of Determination and Unity"
Arizona Rep. Martha McSally (R- CD2) set the stage for the the U.S. House of Representatives' debate on the nuclear arms deal with Iran this morning, noting that the attacks by "Islamic terrorists" on 9/11 (2001) "sparked a renewed sense of determination and unity that should not be forgotten." McSally's one-minute speech on the House floor came immediately preceding the suddenly-tense House debate on the nuclear agreement. She focused on 9/11, especially remembering two victims who were born in Tucson - Aaron Jeremy Jacobs and Karol Ann Keasler. While not specifically mentioning the debate on the Iran deal, she did note that "we are in a generational fight against terrorists, like ISIS, who seek our complete destruction and that of our allies and our way of life. Arizona Senator Jeff Flake sat for his first PBS interview with Charlie Rose late last month, and discussed the nuclear deal with Iran, Donald Trump's frontrunner status in the GOP Presidential race, and other issues.